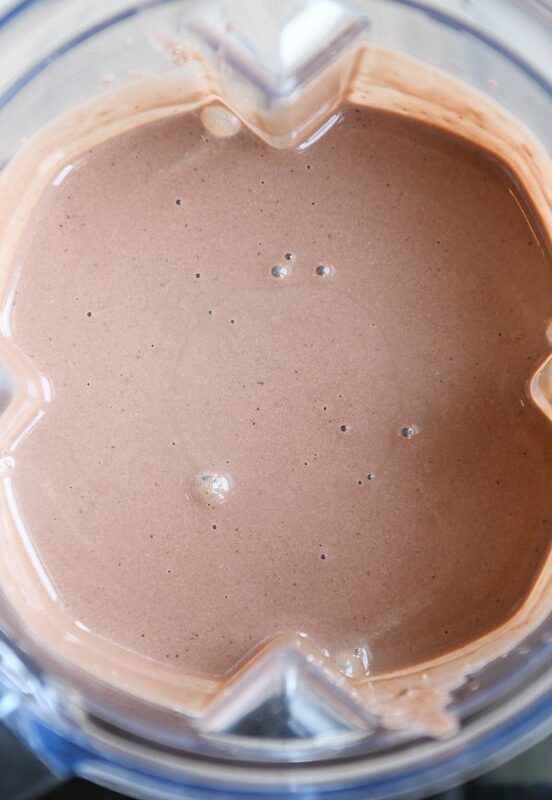 This vitamin-rich, healthy chocolate protein smoothie is the perfect on-the-go breakfast…or just because you’re craving something delicious and chocolate! I don’t know if I’ve ever made something so many times in a row in a given week as I have this delectable little smoothie. This chocolate protein smoothie is already winning some major fan awards around here. We can’t get enough! I’ve posted a handful of smoothie recipes over the years, but if I’m being honest, I don’t venture out of my smoothie rotation much because we’ve had some pretty bad tasting healthy smoothies over a lifetime, and we’ve been scarred. There was one time I swear we all sat looking at each other chewing our smoothie and getting grassy bits stuck in our teeth and wondering how to politely spit it out somewhere discreet. Yeah, that was a traumatic experience for all. I’m happy to report that while this chocolate protein smoothie is incredibly healthy and vitamin-rich, it doesn’t taste even remotely like grass. It is delicious! 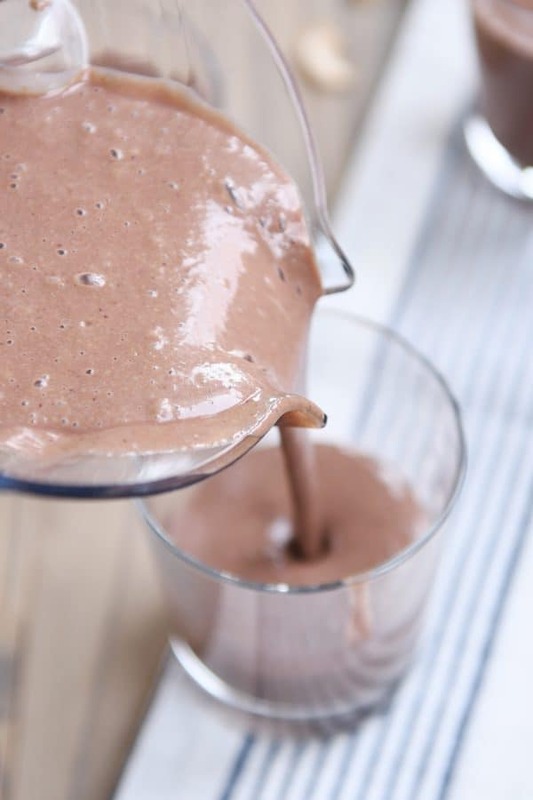 With no added sweeteners…and all-natural ingredients…this creamy chocolate smoothie has solidified a place as a breakfast (and afternoon snack) staple with my kids slurping it up faster than I can make it. You guys, IT’S SO GOOD! Because I usually have homemade kefir coming out of my ears, it’s what I use for the base of this smoothie (hello, probiotics! ), but almond milk or any other type of milk would work delightfully well here. As I note in the recipe, the ingredient amounts are very adaptable (and I’ve given some additional insights at the bottom of the post). While I’ve been sticking pretty close to this particular ingredient lineup, I usually don’t stress about measuring anything. A handful of this, a handful of that. I’ve started freezing all the bananas I can find and stocking up on frozen cherries from Costco because I do not want even five minutes to get in the way of me being able to whip up this chocolate delight at a moment’s notice. I’ll be honest, when Theresa, a sweet MKC reader sent me the recipe, I wasn’t sure if it would make my soul sing. I mean, it’s a smoothie after all! If I want a chocolate fix, I’m going straight for the cookies. But I knew no one in my family would complain if I found a way to change up our rather boring kefir smoothies that we drink literally every morning for breakfast. Especially if the new and improved smoothie was all-out chocolate. And wow. I’ve never had a healthy smoothie (or a chocolate smoothie, for that matter) taste this amazing. -You definitely want to use unsalted cashews for this recipe. You can experiment with other nuts as well, but I’ve found cashews blend amazing well in this smoothie recipe. If you only have salted nuts, try rinsing them really well. -I have and use a Vitamix. You can see a comparison I did between Vitamix and Blendtec here. 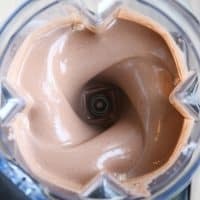 I don’t think you necessarily need either of these blenders for this smoothie recipe, but you definitely want to use a blender that can…well…blend pretty darn well so all those magical ingredients combine into the spectacular frothy creaminess that is this chocolate protein smoothie. -The protein powder I use regularly is Vital Collagens (I get it at Costco). It is unflavored/unsweetened. Any protein powder you like the taste/texture of will work great here. And you can leave out the protein powder, too. -Frozen bananas and frozen cherries are key for a super cold smoothie vs just a pitcher of chocolate liquid. I haven’t subbed in other fruits (yet). Also, I’ve discovered that frozen cherries on their own make the most amazing snack (totally worth the tummy ache later). -If you are new to throwing greens in your smoothie, please, please trust and believe me that you literally cannot even remotely taste the spinach. Not at all. That’s a pretty sweet deal considering the pumped up vitamins it adds to this smoothie. Ok, there you go! More words than you probably needed to read about a smoothie, of all things, but it was necessary for you to fully understand the life changing power of this chocolate smoothie. If you try any variations, be sure to report back! I’m not brave enough to venture out quite yet because this particular set of ingredients has made me just so very happy. 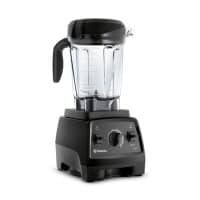 Add the ingredients in the order listed to a high-powered blender and process until smooth, scraping down the sides if needed. You can see from the ingredient list that this smoothie is rather adaptable. I don't usually measure much; I just throw in a handful of cashews - same with the spinach. If using almond milk, you can use unsweetened or a sweetened vanilla variety. If you'd like the smoothie sweeter, you can add in a pitted date or a drizzle of honey (but that's not really necessary especially if using a whole banana). My favorite protein powder is vital collagens. It is unsweetened/unflavored. A good blender should have no trouble blending the cashews super smooth with enough time. Also, Dutch-process cocoa will make the smoothie a bit darker and sweeter than natural, unsweetened (I've used both with great results). Recipe Source: sent to me by a reader, Theresa (inspired by her sister Annie’s made up smoothie recipe) – thanks, ladies! My husband is allergic to cashews. What would you recommend for a replacement? Finally got around to making this and I’m glad I did. Used chocolate protein powder. I felt like I was drinking from the river of Wonka’s Chocolate Factory. So much rich and chocolaty goodness. Wow! And you’re right, it totally doesn’t taste like grass–not a thing! Thanks for the recipe. I definitely think I can keep the chocolate craving in check with this one! I love this smoothie! But I have to up the cherries because the cherry+chocolate combo is amazing. Thanks for sharing this goodness! This is a game changer!! I would easily take this over a bowl of chocolate ice cream (I really enjoy chocolate ice cream). I made it with whole milk since that is what I had on hand. I’ve been enjoying this for the past couple of weeks since you posted it but today I used ideal fit chocolate coconut protein powder. Oh my goodness! Try it now! My sister just told me the same thing tonight. Yum! I used whole milk (because it’s what I had) and omitted the protein powder (because it’s what I didn’t have). Turned out great, especially when paired with your oatmeal applesauce muffins! Thanks for giving me a healthy breakfast option! SO SO yummy! Looks like I’m keeping these ingredients on hand! Haha, can’t argue with that reaction!! So cute! This is absolutely delicious! I made it without the protein powder since that isn’t something I keep on hand, and I used a whole banana to make it extra thick and creamy. I’ve also substituted frozen blueberries for the cherries when my grocery store ran out of frozen cherries (gasp! ), and it’s still delicious. The blueberries don’t change the flavor or texture, but they do change the color a bit. 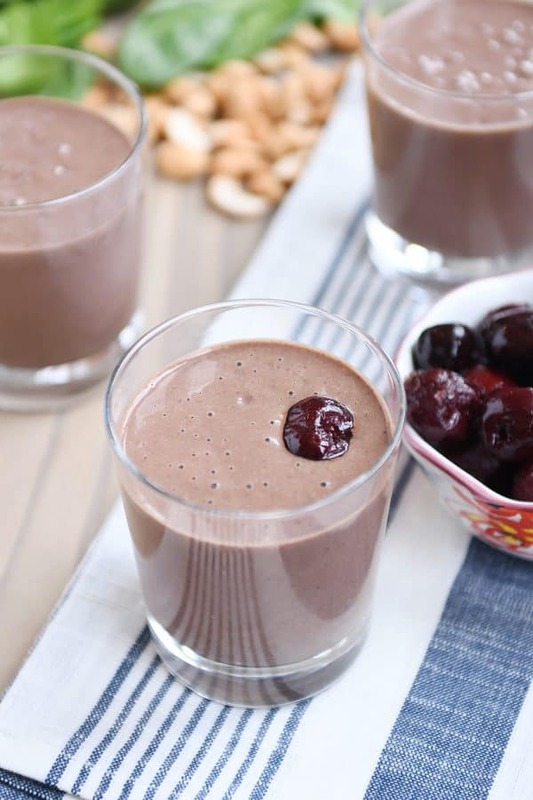 The cherries keep the smoothie a chocolatey brown color, while the blueberries darken it into a purplish/dark grey color. Not quite as appetizing to look at, but still very tasty! Thanks, Margo! Glad to know blueberries make a great sub for the cherries! I love this!! Absolutely delicious chocolatey goodness. I left out the protein powder since it’s not something I keep on hand. I used the full 15 cherries and a whole banana and it was still nice and thick and creamy. This is my new go to smoothie! Also, in a pinch, when my grocery store was out of frozen cherries, I substituted a couple of handfuls of frozen blueberries. Using blueberries doesn’t change the flavor or texture, but it does change the color of the smoothie. Rather than turning out a nice chocolatey brown, it turns a kind of purplish/dark grey. Not nearly as pretty to look at, but still very, very yummy! So I feel really dumb asking this, especially since I’ve been cooking homemade meals for my family for over 11 years, but what is kefir? Reporting back I love this so much I ordered a 6-at-a-time cherry pitter from Amazon so that when it’s cherry season I can pit and freeze my own cherries. I’ve never had those frozen before. Yum!! They are amazing in this smoothie. Haha. Love this! I freeze cherries in the summer, too, and they are divine. One tip: I freeze the pitted cherries in a single layer on a baking tray before popping them in freezer bags (or food saver bags). I’ve made this a few times now, and I LOVE it. It actually keeps me full! Do you think it would work to add in some iced coffee? I love the smoothie, but I’m a little too full to drink my coffee along with it. My tummy feels all sloshy. I’m sure you could try! Wow! My kids and I just had this for a snack. I used chocolate almond milk, and the rest of the ingredients were the same. It was delicious!! You can’t even taste the spinach, cherries, or cashews- pretty much just chocolate and banana! Thank you for the recipe! THIS IS SOOOO YUMMY! I like my smoothies really cold and thick, so I froze ALL the ingredients (separately) except the almond milk. 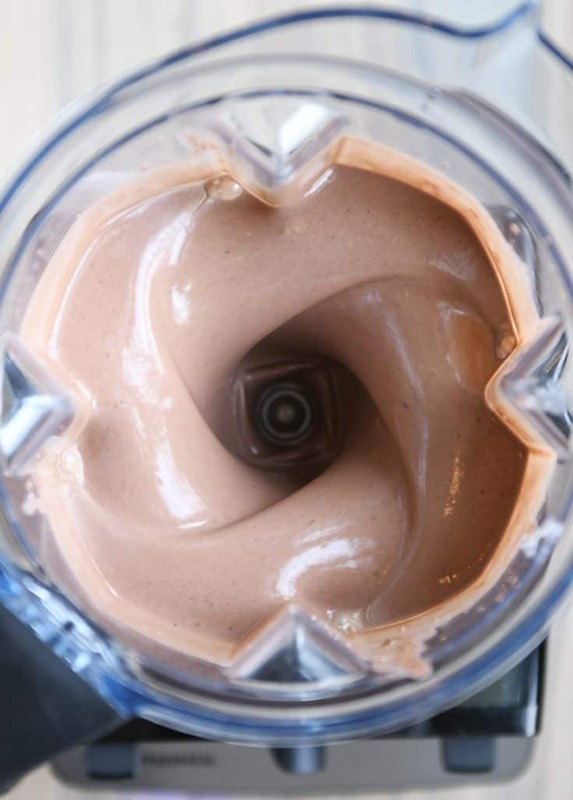 When blended together, it’s the consistency of a thick shake! Yum. Kristen, (who commented April 10 and said it tastes bad), do you think it’s your protein powder? I just left it out completely. There are some really gross tasting protein powders out there. Thank you again, Mel, for a fantastic and healthy recipe! Love, love, love your site! You are such a blessing to me and our family! My husband says he is going to put a sign in our kitchen that says “Mel’s Kitchen.” Ha. Haha. Your husband is funny (I hope he’s joking). 🙂 And thanks for your review on this one! We’re still making it nonstop – so good! And it makes me happy that so many are loving it, too. 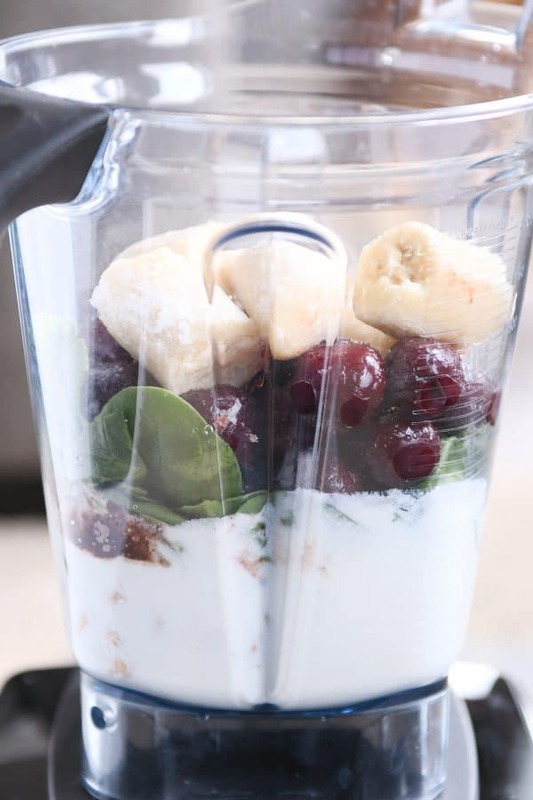 Hey – so I used the same protein powder as Mel and once I tried it with a whole banana and more cherries, and left out the spinach completely it tasted much better! Maybe my spinach was bad… Anyways, I like it now! I’ve had it pretty much every day the past week and I keep craving it. Tastes fantastic, and healthy! What else should I ask for? More great recipes! Thank you very much, Mel! Finally made it! Love it! Love you! I actually made this exactly as written–except I used a room temperature banana. I would have used a cold banana but who knew you couldn’t peel a frozen banana??? 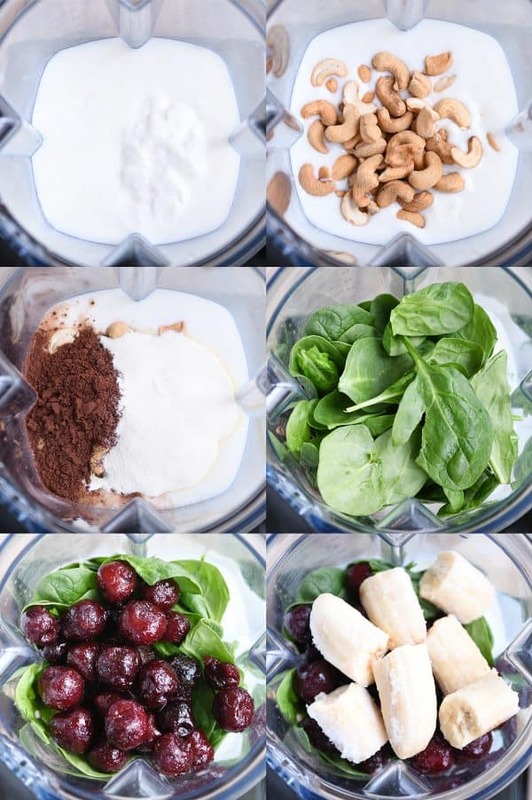 Excellent smoothie–one that we will use as a meal replacement in the summer when we come home late from a bike ride. Love that there is no sugar added and it is plenty sweet! I’m glad you liked this one, Cinda! I also have it pegged for a summer treat already too! But with coconut milk. The canned kind. Oh. My. Goodness. Mel – Thank you so much for sharing your recipes! I love them! Except this one is not turning out for me…. I’m not sure what I’m doing wrong. I used half a frozen banana instead of a whole, and fresh spinach that I had thrown in the freezer – would either of those things make a difference? Thanks! Hey Kristin – can you help me understand what’s going wrong? Is it the texture? Or the taste? I have never used frozen spinach and so my guess it that may be the culprit since I can only vouch for using fresh spinach. But let me know what’s going on and we can try to get to the bottom of it! Hmmm. You might also try adding in a few extra cherries and upping the banana to a whole frozen banana. Hi Mel. This is Lucy. I’m at Costco and I’m having a hard time finding which protein powder you use. Would you be able to take a picture of the one you have for me? I would appreciate that. This is good. The combination of tangy kefir and rich chocolate and sweet tangy cherries and the thick creaminess from the bananas and cashews…it’s like nothing I’ve ever tasted before. No flavor overpowers another. It’s the trifecta of smoothies–healthy, filling and crazy delicious! This is my third day in a row drinking it and I never share it with anyone and I can’t wait to drink it again tomorrow. Thanks for letting me know, Rachell! We recently made your Incredible Chocolate Pudding that used the dark chocolate almond milk. Would that be good with this in place of plain almond milk and the cocoa powder? Yes I think it would be tasty! I just bought all the ingredients to make this. So excited to try it! How much do you multiply this recipe to feed your family of 7? I triple it (mostly) – I kind of eyeball it. Not everyone drinks the same amount but that gives us a pitcher full. This is a new favorite. Thank you for posting! Mel, my family loooooves this smoothie recipe. I quietly assembled the ingredients last week and nonchalantly made it this past Saturday morning. I have pledged to keep frozen cherries on hand at all times from now on (that’s the only ingredient that isn’t in our regular lineup). The thing about smoothie recipes is that you’d like to think that you barely need a recipe and how hard could it be. But that is SO untrue. One false move and you’ve ruined a bunch of frozen bananas with a barely drinkable sludge. I already loved you, but this recipe made my kids feel like they too know and love you. Thank you, Mel! Hahaha. “barely drinkable sludge” YES. That has happened too many times in my life to ever look down my nose at a smoothie “recipe” ever again (although I confess, I do get tempted at times to start the high road of no-recipes-needed-for-innocent-little-smoothies and then am quickly corrected). I’m SO thrilled you liked this, Nicole, and it pleases me to no end to hear your kids loved it so much, too! I also have taken the frozen cherry pledge. Thanks for letting me know! THIS IS THE BEST SMOOTHIE EVER!! Thank you! Thank you! My entire family loved it! I used So Delicious coconut creamer since we are dairy free and it worked great. So happy to hear it, Elizabeth! Thank you! Another great recipe from you. Most smoothies don’t fill me up. I’m starving in no time, even when I add protein powder but this one has kept me full and it’s almost lunch time. I think maybe the cashews help make it more filling. I’ve never thought to add nuts to my smoothies. The chocolate taste is amazing. I sent it right away to my sisters who are chocolateholics as well. Thank you. Thanks, Loni – I agree with you – I think it’s the cashews that help keep me full, too, which I love. I must have done something wrong. It was so sour and gross I dumped it out. I have the Kefir. I used a different sample of some unflavored collagen protein (couldn’t find the one you use!) and maybe that made the difference? I also didn’t have spinach but rather a mixed greens salad box which I (un-carefully) pulled spinach out of. Maybe it was because I used too much Kefir.. I was close (but eyeballing) a cup of kefir.. Either way, I’m on a mission to taste what you’re all tasting! I love my Kefir, strawberry, mango, banana smoothie every morning but it’d be nice to have some varietY! Heading to whole foods today because I’ve seen them having a bunch of the sample sizes of the protein powders. Hey Amy – were the cherries you used sweet cherries or sour cherries? This is SO delicious! I had to scrounge up the ingredients to make it. But I’m going to Costco soon to restock. My whole family loved it enough it might dethrone their favorite smoothie. Thank you! Tried this smoothie this morning. It’s my new favorite smoothie recipe! Thanks for a winner! Well, you were right….again. You cannot really taste anything but the chocolate! I have one prepped and in the freezer for tomorrow morning! I now buy that Silk Dark Chocolate milk, because you have ruined me forever and I love that stuff and I used that instead of regular almond milk. I should not have added the cocoa, but I did. I will skip the dark chocolate almond milk from here on out. Great recipe! A new grocery store here carries that dark chocolate almond milk in gallon size!!! It’s revolutionary. Ran to Costco last night for the cherries and a plant-based protein powder. Made this for my daughter this morning — WOW! I can see why this has been on repeat in your house. It’s delish! Yay, Alicia! Glad it was worth the trip to the store! Glad you loved it, Lexy! This is also delicious with frozen cranberries. I am looking forward to trying this! I just picked up the Vital Proteins powder at Costco. It is on sale until April 21–woohoo! However, our Costco doesn’t have any frozen cherries. Any thoughts on a good substitution? Thanks! I Found A nice big bag of frozen cherries at my Local Walmart. I don’t live close to Costco and Sam’s also doesn’t have them. Um…this was the best smoothie I’ve ever had! I just made it for a light dinner for the family and, after they’d all rated it a 10/10, I took maybe too much joy in telling them that there was oodles of spinach in it. My brand new Vitamix just arrived today. Perfect timing. Thank you for yet another incredible recipe, Mel! Yay, Natalie! So happy…and love the idea of serving this for a healthy dinner. I’m not a huge protein powder lover but this was surprisingly delicious! I’ll definitely make it again. Thanks for letting me know, Jayme! I am so excited to try this! We have been making a smoothie every single day for YEARS (go Vitamix!!!) and my kids…well…they are far from excited about having to drink it every day. (To be honest so am I). I always figured, even if the rest of the day we eat horribly, at least I know we got SOMETHING healthy in us. I will totally be trying this next week! I think my kids will die of excitement. Chocolate! For breakfast! Sounds delicious! What brand of cocoa powder do you use? I’m glad you liked it Mel! I made it this morning for breakfast before I read your post. 😉 Just love you lots around here! Keep up the good work! Thanks so much, Annie! Love this recipe and appreciate you for sending it to me! I was wondering whether frozen spinach would yield a similar result…I’m thinking it would turn everything green…I’ll try it. You’d definitely want to use less (which you probably already know) – report back if you try it! I buy the bags of prewashed baby spinach at the grocery store and pop those in the freezer. That way I never have slimy spinach if I don’t use it all within a few days. It also helps keep the smoothie nice and cold! I wouldn’t want to use it for a salad after it’s been thawed, but for smoothies it works awesome! I’m so happy you loved the smoothie! Wow! Thanks for posting, Mel. I am grateful for the work you do to make our home a happier and tastier place to dwell. Thank you so much, Theresa! So many others are falling in love with it, too. You are a smoothie genius! Is the protein powder necessary? Or is it tasty also without.? CAN I USE COCONUT MILK INSTEAD OF ALMOND MILK. I’m making this tomorrow morning. Don’t normally want any chocolate that early but it’s got me intrigued. Does that collagen really help you? I really like it. I’ve tried so many natural protein powders over the years and it’s the only one I’ve used consistently (can’t stand the taste of most others). I don’t know if I’ve seen any miraculous benefits, but I like the boost of collagen protein it gives. I love smoothies but 2 of my boys do not. Hopefully they will love this one because it is chocolate. I get my Vital Proteins at Target and love that you have it in this. I am allergic to nuts but we have chickens. I am thinking I will use 3 freshly laid eggs’ yolks in place of the nuts. I will report back. This looks so yummy and nutritious. You could always put in a seed butter- tahini, sunflower, etc.. since you’re allergic to nuts and still get that creamy add in! I just whipped up an improvised version and I can definitely taste the potential! I used half milk and half strained yogurt; in place of cashews I soaked some almonds in boiling water to soften (and inadvertently learned how easy it is to blanch almonds! ); I only had tart pie cherries but used them anyway; and the only banana I had was room temp and supremely brown, which I know from experience would overpower the flavor, so I added two pitted dates and some ice instead. Definitely a departure from the recipe as written, but it’s still pretty tasty and I can’t wait to try it with the right ingredients. Thanks for sharing! Haha, love how it can transform into something different with all the slight ingredient variations, but I love that you went with what you had on hand and made it work! I went to Costco today to get the right stuff, and ended up only getting bananas. I think I’ll stick with the tart cherries and almonds for now (gotta respect the grocery budget!). I’m excited to try it again. I added the ingredients into My Fitness Pal as 2 servings, and using unsweetened almond milk. I got it as 268 calroies per serving. Of course, it will depend on what protein powder you use. I have chocolate Orgain right now. I want to try Mel’s though. Can you substitute regular low fat milk for the almond milk or Kefir? If so, have you tried the substitution and was there a big difference in the taste? I haven’t tried subbing in cow’s milk in this smoothie, so I can’t say for sure, but I’m guessing it will probably work! I use a chocolate plant based protein powder, I add, almond butter, 1 tbsp of chia seeds and flax seeds. I also do a chocolate protein powder, pb2 powder, banana, chia, flax, almond butter, and 1/2 cup quick oats. Delicious. Hi Connie – I peel the bananas and throw them in a freezer bag. Yum!! This is very close to the one we make almost daily, but I haven’t done cashews, that sounds amazing. We always throw peanut butter and flax seed in ours as well, because chocolate and PB . Can’t wait to give this a try! I have bags and bags of frozen cherries from my tree last year. Can’t wait to use them up before this year’s cherries come. We are not cherry fans in this house. Is the cherry flavor strong? What substitute would you recommend? Hi Angie, I don’t think the cherry flavor is strong at all. It’s very subtle and when I made this the first time, no one could even tell there was spinach or cherries in it. I have a few smoothie recipes that I ADORE that take frozen unsweetened cherries. I don’t think the cherry flavor is strong at all, and I don’t like cherries. I think this smoothie sounds delicious and I can’t wait to try it! My kids still have spring break for another week this week (WOOT) so we will be making this for sure. Oh my gosh! Proof read! Nut allergy! It’s early where I live. Exactly which Vial Collagens protein powder do you use in the smoothie? I am getting the ingredients today!!! This recipe is perfect timing! My husband is having some jaw work done tomorrow and will be living on smoothies for a couple of weeks. I’m allergic to dairy and blended cashews are a great way to get things creamy without dairy. A tip for getting cashews blended well even if you don’t have a professional grade blender is to soak them. Either soak them in water overnight or if you didn’t plan ahead, you can pour boiling water over them and let them soak for 15 minutes. Then drain, rinse, and blend. They’ll be softer to start with and blend more easily. Thanks for this! I was just going to ask for details about possibly soaking the cashews because our blender isn’t a superstrong Vitamix or Blendtec. I’ll give it a try! So I’m one of those people with a bit allergy in the family. Are the cashews simply for health benefits (and probably some yumminess) or are they vital? I guess I can give it a try without them, but I thought I’d ask first. Cottage cheese will add creaminess and protein! I love using it in a smoothie recipe I use that ends up tasting like a milkshake! Hey Kim – good question. The cashews add creaminess and a bit of protein. Is there a nut-free type butter (like sun butter) you use with good results? You might try subbing in a couple tablespoons of something like that. Had to try this today. I used half an avocado instead of chasews and coconut milk instead of almond milk (because I’m doing a whole30 to get an autoimmune disorder under contro). It worked well! Still creamy and couldn’t taste the avocado. AND DELISH!!!! Does the cherry flavor really come through in the smoothie? Could I leave it out or would that alter the finished taste? I just made it and I don’t taste the cherries at all. I’m sure you could sub blueberries as well. Hey Laurie – I agree with Laura – I don’t find the cherry flavor noticeable. You wouldn’t want to leave them out without subbing in another frozen fruit for texture and sweetness. I’ve only made it with cherries but you could try to sub in another fruit. Any particular reason cow’s milk wasn’t included in the substitutions? We have a tree nut allergy in our household, so we can’t use any tree nut based ingredients. Thanks! Hey Tiffany – no reason other than I’ve only made it with kefir and almond milk so I hesitate to give substitutions if I haven’t tried them myself. But I’m sure cow’s milk would work just fine! Can you tell me how many calories are in this shake? I haven’t calculated the nutritional info so I’m not sure. Sorry! There are a lot of online nutritional calculators that can do that for you if needed. Wahoo! I always look forward to a good smoothie recipe. Thanks!! Any suggestions for something other than a banana? I absolutely hate bananas and can taste them in everything, no matter how small the amount. I have heard about freezing an avocado for smoothies but haven’t tried that yet. Hmmm, the avocado definitely sounds like a good idea for a frozen creamy substitute. I’ve found that frozen pear works really well as a banana replacement. Adds the sweetness like a banana but not an overpowering flavor. I use a frozen avocado all the time and it gives the same creamy texture as a banana but just like the spinach, you don’t taste it. I cut up a whole one into chunks and freeze, then usually use 1/3 at a time. I’m allergic to raw bananas and have been looking for a replacement in smoothies as well. I’m allergic to avocados too. I read the comments on another one of Mel’s smoothie posts and someone recommended a few frozen grapes for added sweetness. I’m also planning to try frozen coconut chunks from Trader Joe’s. The pear suggestion is a good idea but I never have pears on hand. I wonder if I could get canned pears and freeze them?